Dear Friends Assalam o Alaikum, I hope you are all of them are good.and Also thanks to All Visiter. I know that since starting of Prime Minister's Training Scheme, the Selected Candidates of PMYTS also called as an Internees of Prime Minister's Training Scheme, having all of them are so many problems in their Internship. Most Common Problems is mention below. If you submit your monthly arriving, Known as ( Attendance and Progress Report ) of every month and after this, If your Assessment History Shown as a No Record Found on Web Portal so don't worry just visit the link below for this problem. download assessment form. 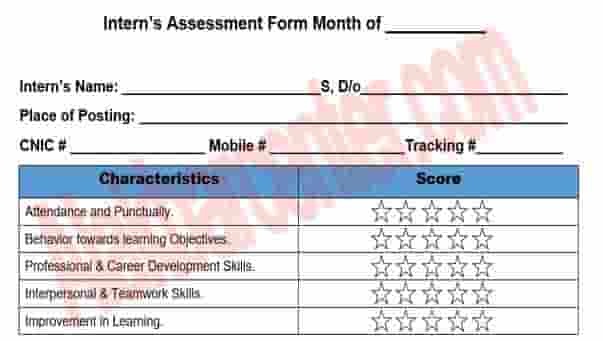 Intern's Assessment Form shown as above image and Fill up form. After fill up Intern's Assessment History Form Please go to your Reporting Officer for Attestation. The next step is to send this form to NIP Office Islamabad Directly By Courier System are any other which one is better for you. Visit: Bilalakbar.com for more info about pmyts.